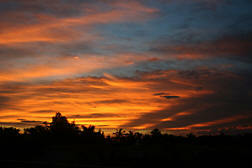 We have heard such scary news in the press about traveling to Mexico these days that make us think twice about going. 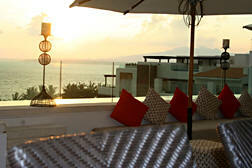 Mexico is one of my favorite destinations though, and I am a frequent visitor. I am convinced that this distorting overview is designed to sell newspapers and create a buzz rather than to offer a clear picture of what is happening there. Many countries have small pockets of territory that are not visitor friendly and while we don’t go to those, we don’t write off the whole country! With that in mind I headed south to explore a region of the coast that I had never seen. The “left” coast of Mexico is a land of legendary sunsets that linger for hours, long wide golden beaches, plenty of fresh local food and cultural shopping. Sometimes the hotels leaned on the side of “roughing it” which was pleasantly authentic when I was in my 20s, made travel with kids feasible in my thirty’s and forty’s but over the next decades my taste for a lovely room with a great mattress and luscious surroundings has gained momentum. Riviera Nayarit is the region around the beautiful bay Banderas and several miles north offering an evolutionary trend that my old bones appreciate. The charming old world aspects of regional traditions seem to merge nicely with the new elegantly refined hotels, a marina that can support super yachts, and restaurants that appreciate the fresh grown fruits, vegetables and fish delivered daily and put these treasures in the hands of sophisticated chefs who cater to elegant open air dining environments. Often the golden beach is one step off the dining room with the turquoise ocean just past that and all of it infused with warm breezes and honeyed scents. I flew into Puerto Vallarta and met the hotel driver for a 10 mile ride north up the coast to Nuevo Vallarta and La Estancia. There was nothing dramatic or notable about the ride up the coast, but there certainly was about the La Estancia. The architecture is a modern rendition of colonial Mexican style which focuses on privacy, comfort and a seamless transition from inside to outside. Water is everywhere, pools down to the ocean, soaking tubs on decks, wading pools with pebble bottoms, and all of it surrounded by the deep fluctuating turquoises of the sea. 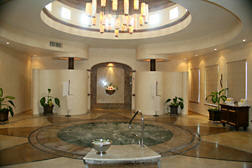 The spa at Estancia is one of the new style entirely focused on grace and comfort and relaxation of the senses. 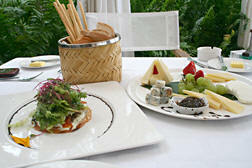 The restaurant has high ceilings and a fresh inventive menu. From there I toured up the coast looking for a mix of traditional life and the new infusion of luxe comfort that is evolving here. Bucerias is a step back in time to relaxing days of open air markets with everything from silver, to clothing to fresh ceviche and fruit drinks sold on the streets. Bicycles provide much of the transportation, and of course all streets come to the golden beach. 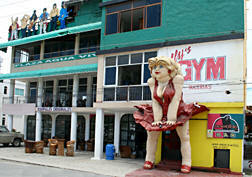 And of course, you simply can’t ignore the entrance to this gym right on the main street. Next stop, Sayulita. This is a lovely traditional Mexican village with carved signs, cobbled streets and painted walls. 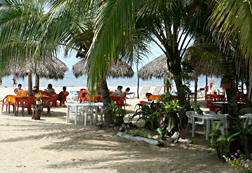 Huge trees overhanging the beach where food and drinks are served in the shade by the sea. Perhaps 10 blocks wide along the beach, and several blocks back you will see galleries, shops, bakeries, baskets, and all manner of interesting things to explore. About a decade ago, Sayulita began attracting artists from all over the world, and the cumulative effect is totally charming. Further up the road is San Pancho, adorable in its authenticity. Its history painted permanently in the town square on the long wall to the beach. 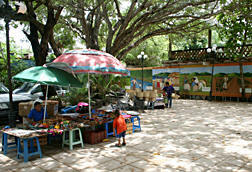 Vendors sell their wares under huge spreading trees in the square, and the ever present surf rolls along the front of the town. The curious feature I found there was a polo club. It seems being born there entitles one to be a member, take polo lessons and participate in tournaments. 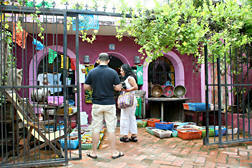 That with the myriad of small shops, restaurants and galleries make it an enchanting place to wander about. 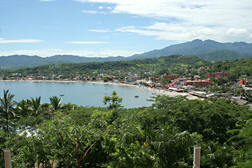 The next town that really won my heart was Rincon de Guayabitos. I first saw it from the top of a knoll at a pub called Vista Quayabitos which gives a commanding and endearing insight into the joyous lifestyle to be found here. Festive is the word that really suits this place, and while I was only there during the day, I could see how much fun it would be when the lights come on at night and there is music and food flowing through the streets and down to the beach. This new blend of comfortable old world style, with updated and handsome facilities has the Riviera Nayarit evolving into a region that deserves to be separated from the bad news that we keep hearing about Mexico! I had a wonderful time, amid beaches, great food, fun atmosphere, fabulous authentic shopping and not a bandito in sight!